Truffula trees come to life and roam free in this sneak peak of ‘The Lorax’ that’s playing in 3D. With a cast like Zac Efron, Taylor Swift and Betty White to name a few, there’s no telling what this movie has in store for you. One man found a collection of Dr. Seuss stories that are new. It’s amazing what a bit of sleuthing can do. Just when you thought no more could be found, seven Seuss treasures collected and bound. In 2004 you didn’t have to look far. Dr. Seuss finally got his Hollywood star. Kids read from his books and his wife was there too. To honor the life and achievement of the man we once knew. I hate to break it to the author, but Dr. Suess died in 1991. 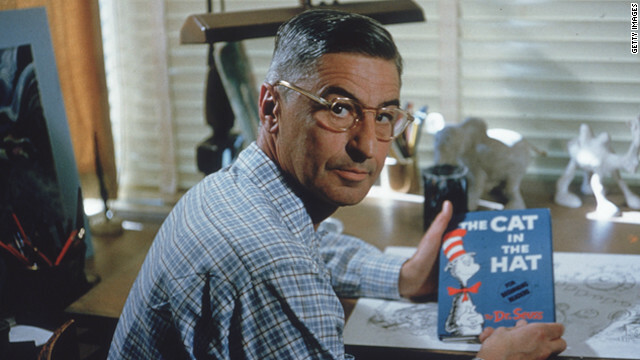 I am very very sure that the author knows that Dr. Seuss has died but everyone is celebrating his birthday anyhow – celebrating his life and to embrace his love for reading. I know my children's school did celebrate his birthday today, Its Reading Across America Day! I worked with a girl who was his great grand niece (I think that's what it would be). Her mother's uncle was Theodore Geisel. She never met him herself, but the connection was still pretty cool to me. And she was a babe. I used to love down the street from Dr. Seuss's house in La Jolla, CA. It's an amazing house.... looks like a huge flying saucer set into the beach cliff. With a hundred windows that overlook the Pacific blue... you can just picture Seuss staring into the sea inspired by the waves. You used to WHAT just down the street...? No, Thing 1 is way more gay. Hollywood keeps trying to cash in on the good Doctor – and sometimes they do make a lot off money of him – but every adaptation I've seen ends up being a real hash. Love him or not, the guy could write a 'movie-proof' book. And that's enough to put him at the top of my list. How do you wish a dead man a "very happy birthday"? Is this article making a mockery of the beloved Dr Suess? I loved the story of ' The Pair	of Pale Green Pants with No one Inside Em'. Any one member that one? Think it was in the same book as the ' Sneetches' . READ in peace, Dr. I love Dr. Seuss, but really, do we have to celebrate his birthday every year? how about once every five years and during the years inbetween we can talk about some of the thousands of other authors who have entertained and educatedd us through the ages. At this point I don't think the memory of the good Dr. has as much to do with books and reading as materialistic crap and brand identification. I don't believe this is his fault, from what I have read it would make him very angry, but unfortunately that is the way it has gone. I love Dr. Seuss he is so funny that he makes my mom laugh 'till she cries. Have any of you read "Hooray for Diffendoofer Day" he wrote it in the time that he died so his friends had to do the rest for him and at the back of the book it shows some of his original notes and illustrations for the book. Congrats on feeling stteled! I, too, am dreaming of the day when I get to look at all of my books at one time, instead of having half of them in boxes in the attic.